This year I am proud to be a part of the inaugural group of "Fashion Stars For A Cause" led by Yvonne Crum and Beverly Drive Magazine. This event will have a big focus on the cause of suicide prevention and how it has an impact in the community and proceeds will benefit the Suicide and Crisis Center of North Texas. There are a couple of ways you can participate: Join me at the gala dinner at Dallas Country Club on March 21, 2014. A table of 10 is $5000 or join me at my table for $500 a seat. Larger sponsorships are also available. If that's a little pricey for you, you can support the cause by purchasing raffle tickets to WIN a trip for 2 to Cabo San Lucas. 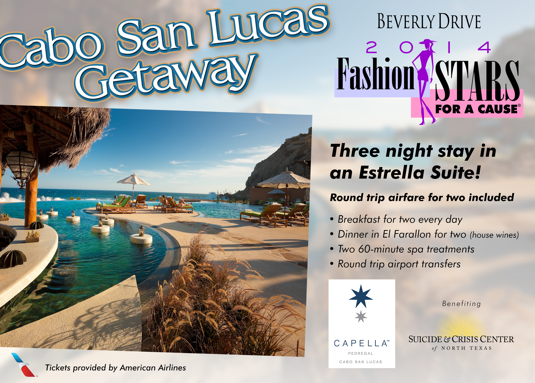 The winner will enjoy two round-trip airline tickets on American Airlines, a three-night stay at the Estrella Suite at the Capella Hotel, breakfast for two daily, a dinner at El Farallon for two, 60-minute spa treatments for two and round-trip transfer from the airport to the hotel. AMAZING!! Tickets are $50 each or 3 for $100. The drawing will be held on May 24, 2014 and you do NOT have to be present to win. Your support is so appreciated by Suicide and Crisis Center of North Texas, as well as the thousands of children and families in our community whose lives are helped by the programs of Suicide and Crisis Center of North Texas. Interested in learning more or want to try your luck at that trip? Email me at cynthia @ohsocynthia .com.